Restaurants that serve oysters sometimes toss out hundreds of tiny, juicy crabs a day—why aren’t they making their way onto the menu instead? Back in November, I attended an oyster roast on Virginia’s Eastern Shore, where one out of every dozen or so oysters I ate had a bonus treat: a tiny orange crab, roughly the size of a dime, lurking inside the oyster’s shell. Since the oysters had been roasted, the crabs had been cooked along with them. I saw other people eating the crabs whole, so I did the same with one of mine. It was delicious—a bit sweet, a bit briny, and soft with just a hint of crunch. I mentioned to a guy standing next to me that I’d never seen these little crabs before. “They’re even better when you shuck the raw oysters, because then the crabs are still alive,” he said in a thick Virginia drawl. “I’ll just pop one in my mouth, let him scrabble around in there a bit. That’s what we call a redneck toothpick!” Several other people mentioned that finding a crab inside the oyster was a sign of good luck. I’d been eating oysters for most of my life—in fact, I grew up in the Long Island town of Blue Point, namesake of the bluepoint oyster—but this was new to me. I soon learned that the little edible creatures are called pea crabs, or sometimes oyster crabs. 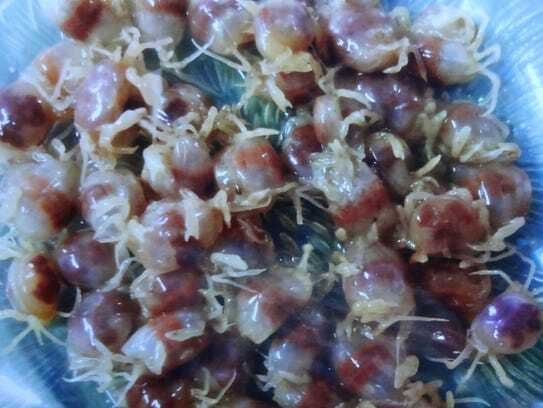 They enter the oysters (and sometimes other mollusks, like mussels, scallops, and clams) as larvae and then grow to maturity inside their host. Because they’re protected by the oyster, their shells remain soft and slightly translucent. Technically speaking, pea crabs are classified as parasites, because they feed off of the oyster’s food supply, but they don’t harm the oysters. If you’re not familiar with pea crabs, there are three likely reasons for that. First, pea crabs are more common in the warmer waters of the Atlantic Ocean, with the Long Island Sound constituting the northern edge of their range. So if you prefer oysters from colder North Atlantic waters, as I do, or from the Gulf Coast or the West Coast, you’re unlikely to encounter them. Second, pea crabs are more common in wild oysters, not the farmed product that constitutes an increasing share of the oyster market. Sketchy George Washington connections notwithstanding, pea crabs have a rich history and once had a much higher profile. A 1913 New York Times article refers to them as “the epicure’s delight” and describes shucking houses saving the little crabs, blanching them, and then packaging them in glass bottles for retail sale. Pea crabs were also commonly featured in old cookbooks. A 1901 volume entitled 300 Ways to Cook and Serve Shell Fish features 16 different recipes for them (one of which matter-of-factly calls for 500 crabs!). I’ve never seen pea crabs on a menu, but I’ve taken to asking waiters to leave them in the shell if any appear in my oysters. Assuming you don’t have a connection to a local oysterman, your best bet for finding pea crabs is to buy some wild oysters harvested from waters no farther north than the Long Island Sound (Chesapeake Bay varieties are a good bet) and shuck them yourself at home. If you encounter some pea crabs, you can try cooking them—a quick stir in the skillet with some butter does nicely, as does Herman’s flash-frying method—or you can just eat them raw. As with any shellfish, don’t consume them if they’re not alive. I’ve never seen pea crabs on a menu—and neither had anyone I spoke to for this article—but I’ve taken to asking waiters to leave them in the shell if any appear in my oysters. The live ones taste similar to the cooked ones I first encountered at the oyster roast—a bit sweet, a bit briny. Even when alive, they’re not very active (living inside the oyster shell tends to render them fairly docile), so there’s nothing particularly off-putting about eating them. Paul Lukas is a columnist at ESPN.com and the founder and editor of Uni Watch. He's also written extensively about food for a wide range of publications.